Although he was a local man by birth*, the Reverend Benjamin Armstrong travelled down from London to Norwich by train on the 14th of September 1850 to take up his new appointment. He came from Shoreditch station in London via Bishop’s Strortford, Cambridge and Ely by train. He remarked on the view of Ely cathedral; just six years earlier this would have been a much more arduous journey; then the only railway line open in Norfolk had been that from Norwich to Yarmouth. After the ceremony in Norwich cathedral he travelled on to his new living in Dereham, again by train. This town had been reached by railway just three years earlier. The station master was immediately an important person locally, and Armstrong makes a point of recounting his wife’s background on the day when he baptised the family’s daughter. The station master’s wife came of Huguenot stock, and her family had been involved in the shawl trade in Norwich. With the new method of transport Benjamin Armstrong could make day trips to Kings Lynn or Lowestoft. London was easily accessible. He could travel to Oxford via the varsity line, a journey we can now can only dream about. Great Yarmouth, where he was amazed at the hundreds of fishing smacks, from Holland, France and of course Britain, was another popular destination. In the summer the flat-bottomed Dutch boats could bring tons of plaice, haddock and turbot to the shore; the fish they off-loaded onto horse-drawn carts taken down to the beach through the surf. In October the herrings arrived off Yarmouth and the docks became packed with drifters. Huge quantities of herring were salted for the export trade, and already fish trains were taking the fresh fish around the country. It was another 24 years before Cromer could be reached by train, but as soon as this town was on the railway network he was off with his family to admire the view. Then it was home to Dereham by bedtime. The day trip to the seaside had truly arrived, and the railway company ran weekday excursions with ladies going half fare. 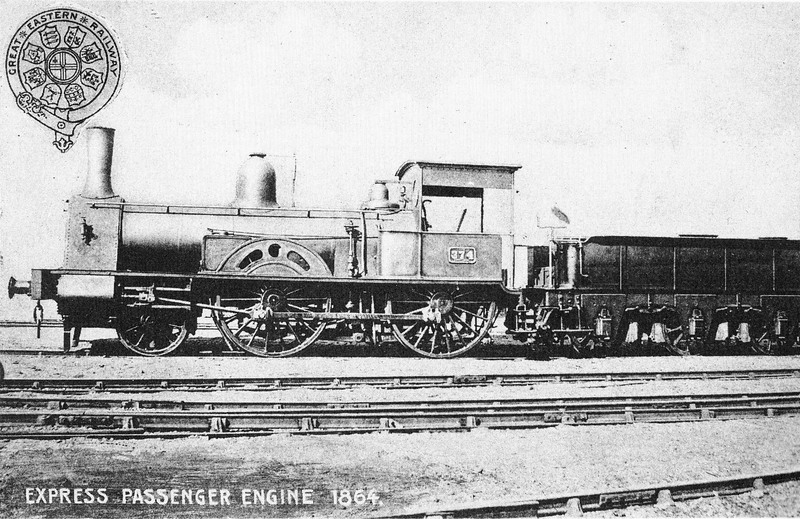 A GER 4-4-0 of 1864. The railway carriages in 1850 (and for decades thereafter) were simple four-wheeled affairs; heating was not at first available, and bogie coaches and corridor trains had to wait until the next century as far as East Anglia was concerned. In 1850 the locomotives were open to the elements (poor train crews! ), although they were covered within ten years. We are definitely in the modern era; in those earliest days of train travel it was slower to go to London than it is today, but not by great deal. Armstrong remarked how he could be in London in the morning and by the afternoon be attending to parish affairs in Dereham. Compare this with just 25 years earlier, when no traveller went faster than a horse could take you. By coach it took all night and half the following day to go from Norwich to the capital. Nor was travel the only way things were suddenly modern; postage stamps had made communication quick and relatively cheap in 1840. The number of letters passing through Dereham Post Office went from 7000 per annum in 1873 to 25,000 just three years later. There was already the electric telegraph to India in the 1850s, and the first local telegraph lines in Dereham appeared at the same time. The first commercial use of the long distance telephone in Britain took place on the 1st November 1878. This was along the 115 mile line from Cannon Street in London to Norwich– where else? This used the telegraph line of the Great Eastern Railway to transmit the human voice. Photography had arrived and soon it was in common use; street lighting was going up in Dereham, and the parson was anxious to install gas in the church.Thomas Cook had begun his excursions, and he took a huge number of the local folk to Dublin and back for 42 shillings each. This wasn’t exactly cheap, but the idea of an overseas holiday for the masses was an incredible innovation. On the sea crossing by steamer there was nothing to eat laid on, but the travellers made do with large quantities of whiskey, cigars and a crust of mouldy bread! The Revd Benjamin Armstrong had married Anne Duncombe in 1842, and brought up his family of five children in the commodious parsonage in the town. (One daughter died in infancy.) The large gardens made a suitable place to hold meetings, as when the Norfolk Agricultural Show was held in the town. Being in the centre of the county, Dereham was also where Norfolk County Cricket Club held its matches in the 19th century. National sporting events get a mention in Armstrons’s diary, such as the occasion in 1877 when the Oxford and Cambridge Boat Race resulted in a dead heat. Mostly his diary is taken up with the daily round of church affairs; visiting the sick, chairing meetings and conducting weddings (he said he preferred funerals). It was a more religious community then than it had been in the previous century (and certainly more devout than it is today), and Armstrong held services every day of the week. Sundays were taken up with multiple church services (two, and he wanted to introduce a third as soon as gas light made this possible). As the choir sang throughout the week the vicar thought they deserved a treat; he took the choirboys on a day’s outing to Lowestoft, and only three of them had ever seen the sea before. The health of the country was still racked by epidemics of smallpox and cholera, and the advances in medicine were slow to exert their influence on the population; anaesthetics were starting to appear (to begin with in childbirth) and surgery was slowly advancing beyond the ‘cutting for the stone’. This operation (without any anaesthetics) had been the commonest one to begin with, and was attended by some success. The wonder drugs, starting with penicillin, were not to appear until the middle years of the 20th century. In all sorts of ways the speed of change has accelerated in the last two hundred years and it still continues to do so; before 1800 many things scarcely changed from one millennium to the next. 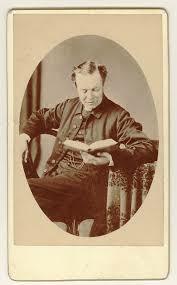 There have been three volumes of selections from the diaries of the Revd Benjamin Armstrong. The first was published in 1949 and the most recent in 2012. These journals are not so well-known as the diaries of Parson Woodforde; Armstrong’s diaries are much more recent in their concerns, in spite of only 15 years separating the lives of the two men. That makes them more understandable but of less historical interest. Look out for further posts mentioning the Reverend Armstrong; there is plenty more of interest in his diaries to digest. *See the correction in the comments section. I’m sorry to correct you, but B J Armstrong was not born locally. He was born in London, where his father was in business. Otherwise I think this piece is a fair reflection. Chris Armstrong (Great Grandson of the diarist& editor of the most recent published volume of his diary. Thanks for putting me right on this. I ought to correct my blog post, but that would make your comment meaningless, so I will put in a footnote directing people to your comment.